Factory style replacement Seat Covers. Manufactured in U.S.A. to factory specifications and workmanship. Made with Original Jaguar Euro Leather, 100% fit guarantee and includes 5-year warranty. Seat Covers fit both Left hand & Right hand drive models. This set of replacement Seat Covers is hand crafted for the Jaguar XK8 & XKR models, and fits the 2001, 2002, 2003, 2004, 2005 and 2006 model years. Made with Factory style plastic retainers, factory style stitching all around, seat inserts are Lined with high density foam rubber as Original. Customer Randy Murphy says: Over and over Vic at TopsOnline has been raved about from forum members and there's a good reason why, the leathers look and fit exactly like factory. SUPER high quality workmanship and materials. Thank you Randy! Front seat covers fits both Coupe & Convertible models. We offer 2 different Factory Style Seat Covers, please choose the Style matches your existing seat covers. These are original style replacement front seat covers & will replace your existing seat covers (not slip-on type). Below we listed most popular colors, other colors can be ordered, please inquire. Front Covers kit includes, 2 front seat Cushion covers & 2 front seat Backrest covers. 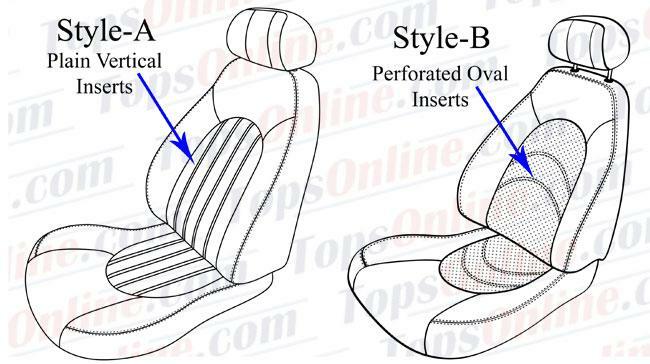 Headrest Covers & Center Console Armrest Lid Cover are not included; you can keep your existing Headrest Covers & Armrest Lid cover if they are in good shape or you can purchase them separately. If you are not sure which color to order? e-mail us the 3 digit Trim Code located inside the driver side door plate and we will confirm the color for you. Convertible & Coupe Replacement Leather Rear Seat Cover Options - 5 yr warr. We offer 2 different Factory Style Seat Covers, please choose the Style matches your existing seat covers. These are original style replacement rear seat covers & will replace your existing seat covers (not slip-on type). Below we listed most popular colors, other colors can be ordered, please inquire. The XK series XK8 and XKR were the more successful attempt to reclaim some of the appeal of the E-Type but in a luxury grand touring. This series is especially popular as a daily driver and is reliable with excellent handling and classic modern appeal. The XKR boasts performance upgrades and sportier trim options. Because of their popularity and reliability they are a great vehicle to invest in and brand new seat covers will keep them a favorite for years to come. Replacement seats covers for the 2001 through 2006 XK8 and XKR model range come with four distinct style seats, so you'll want to pay attention to the one that matches your vehicle for the best replacement fit. Center and door armrest covers are also available for these models.